Medina City Hall is located at 132 North Elmwood Avenue, Medina, OH 44256; phone: 330-725-8861. Photo: A. I. and E. R. Root Homestead, ca. 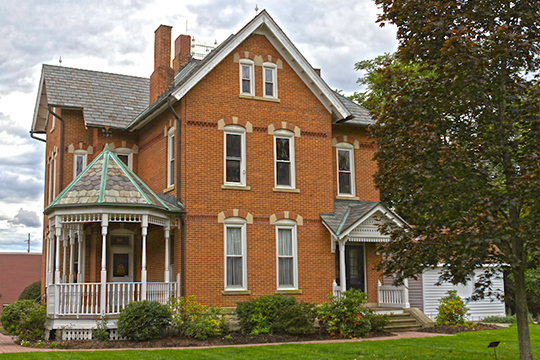 1879, 662 West Liberty Street, Medina, OH. Listed on the National Register of Historic Places in 1975. Photographed by user: Duds98 (own work), 2012, [cc-by-3.0 (creativecommons.org/licenses/by/3.0)], via Wikimedia Commons, accessed October, 2013. An unusually attractive farming community is Medina, first called Mecca. In 1818 a Captain Badger built a log cabin on the site and platted a village. A few houses of New England types, dating back to the early years of its settlement, and the conservative business houses around its shaded square lend the town a primness that is vaguely surprising in its setting of lush farmlands. Building materials and furnaces are made here, but Medina is best known for its bee culture and honey products. It calls itself the sweetest town on earth. The A. I. Root Company Plant, on State 18, four blocks west of the square, has displays of comb honey from all parts of the Americas: alfalfa honey from Montana, orange-blossom honey from California and Florida, laurel honey from the Mid-south, white-clover and sweet-clover honey from the Middle West, and sage and cat's-claw honey from the Southwest. The honey is removed from the combs by centrifugal force, the strained and packaged for market. The company began by chance in 1865 when A. I. Root, a jewelry manufacturer, bought for $1 a swarm of bees whirling over his head. Within a few years he was producing materials for the use of other beekeepers. Today the company, one of the largest of its kind in the world, distributes more than 200 kinds of beekeeping articles, tons of packaged bees and thousands of queens annually, and publishes textbooks and journals on bees and related topics. Pure beeswax candles and educational toys are also made here. Federal Works Agency, Work Projects Administration, Ohio: The Ohio Guide, American Guide Series, The Ohio State Archaeological and Historical Society, 1940.